December 24, 2017 11:04 am. Feature staying events beckon Highlad, who has already made his mark at black type level. 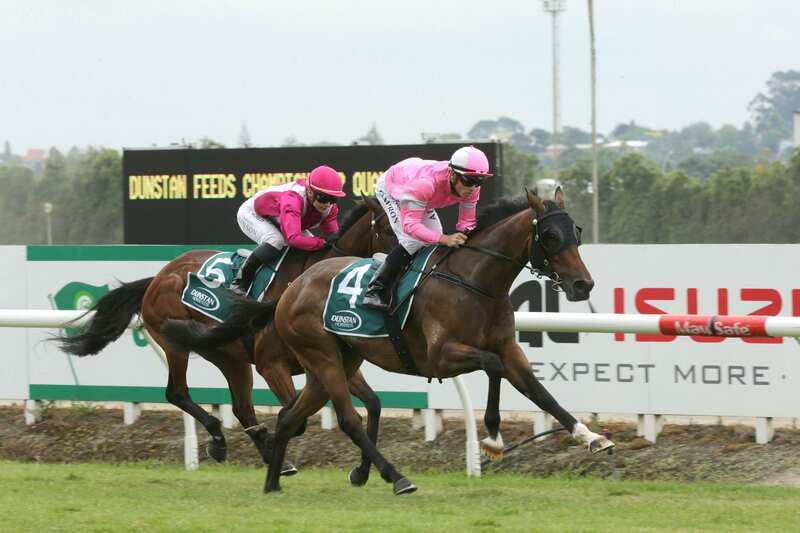 The High Chaparral five-year-old gelding warmed up for Group racing when leading home a stable quinella in the Dunstan Feeds Championship Qualifier (2100m) at Te Rapa on Saturday for Murray Baker and Andrew Forsman with his defeat of Victory Drive. Highlad showed early potential when he won the Listed Wanganui Guineas (1340m) to earn a trip to Melbourne where he placed in the UCI Stakes (1800m). “He was a big baby and he’s matured now and his manners are a lot better,” Forsman said. After jumping awkwardly, Highlad settled in the trail and once into the clear in the straight he lengthened stride to win by a length and a-half. “It was a good effort and I was happy with the way he had to change ground to hit the line hard,” Forsman said. Highlad’s rider Matt Cameron overcame an early scare before settling on the fence and rounding off strongly in the run home. Highlad completed a clean open handicap sweep for the stable and Cameron after Tomelilla claimed the Lodge City Rentals 1600m. “She normally gets back and that leaves her too much to do, but she jumped well today,” Forsman said.